Because we spend so much time in our kitchens, they should be up to date and pleasant to work in. Unless your kitchen is new, you probably have things that you would like to change to make the space work better for you. You may want to add a kitchen island, improve appliance placement or add storage. The kitchen may seem too closed in or small. Counter tops may be worn and out dated. 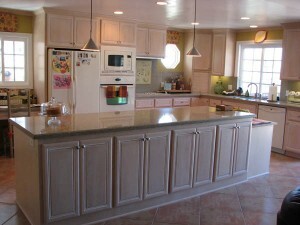 A San Diego kitchen remodeling contractor, or a do it yourself kitchen remodel, can address all these issues. Start by deciding if you are able to do the whole kitchen remodel project yourself, or if you need a San Diego kitchen remodeling contractor to do all or part of the project. There will be plumbing and electrical work which are best done by professionals. Other professionals that you may want to hire are experts in the installation of San Diego windows, entry doors in San Diego, and professionals in removing the wall between the kitchen and dining room, sheet rocking, installing custom cabinets, counter tops, flooring and lighting. Jobs that home owners can do to save lots of money, even when hiring a contractor, are demolition of existing kitchen elements, installing back splashes, installing flooring, painting walls and doing part of the cabinet and hardware installation. What jobs you do yourself should depend on your skill level and time available. If you are hiring a contractor to help with your kitchen remodel in San Diego, you should talk to them about what work you will be doing yourself, and what work they will be doing. The two of you will need to coordinate planning for best results. A good remodeling plan and budget will make the job go more smoothly. If you are using a contractor, you will want them to help you with the planning and budgeting. Part of any good plan is a list of things that are important to you to have in the new kitchen. You want your new kitchen to meet all of your needs. Your new kitchen should use design elements popular in your area for resale value when it is time to sell your home. Visit model homes in your area, look at kitchen design magazines and tune in to kitchen remodeling programs on TV for ideas. You want your kitchen remodel in San Diego to be the best your budget will allow. This entry was posted in Construction, General Contractors, Home Remodeling, Room Additions on January 31, 2013 by budgeit.